Do you think all classic coleslaw recipes needs mayonnaise? They don't! This classic creamy coleslaw recipe uses a bit of cream and malt vinegar to dress the shredded cabbage. The acidic nature of the malt vinegar naturally thickens the cream to dressing-like consistency. Quick and easy, this recipe creates the perfect creamy slaw. It's great for your next backyard barbecue or potluck party. The coleslaw travels beautifully and can be made ahead of time. This recipe makes a very lightly dressed coleslaw. For an even creamier version, simply double the amount of dressing and use the same amount of vegetables. In a very large bowl, combine cream, vinegar, salt, pepper, and celery seed, if you are using. Cut the cabbage in half lengthwise, remove the core, and cut the cabbage into very fine shreds (you can use a mandoline if you have one, but a very sharp knife and a steady hand work just fine). Add the shredded cabbage to the dressing. Peel and grate carrot, if using, and add to cabbage. Similarly, shred and add red cabbage and/or red onion. Toss the slaw, lifting from the bottom of the mixture to bring the dressing to the top. Continue tossing the slaw. It will take a while to thoroughly combine the ingredients. You want the slaw to be completely coated with a small amount of dressing. Taste and add more salt and pepper if you like. Toss again to fully combine. If you use only the green cabbage, your slaw will not be very colorful. By adding the carrot, red cabbage, and red onion to the green cabbage, your coleslaw will be bright with varied colors. Don't be concerned if the cream mixture takes on a reddish tint, this is simply from the juices of the cabbage and/or red onion. Although this classic coleslaw does not contain mayonnaise, you will want to follow some basic food safety guidelines if you plan to serve it outside, especially on a hot summer day. Avoid leaving this coleslaw, and other food items that require refrigeration, outdoors in warm weather for more than two hours. 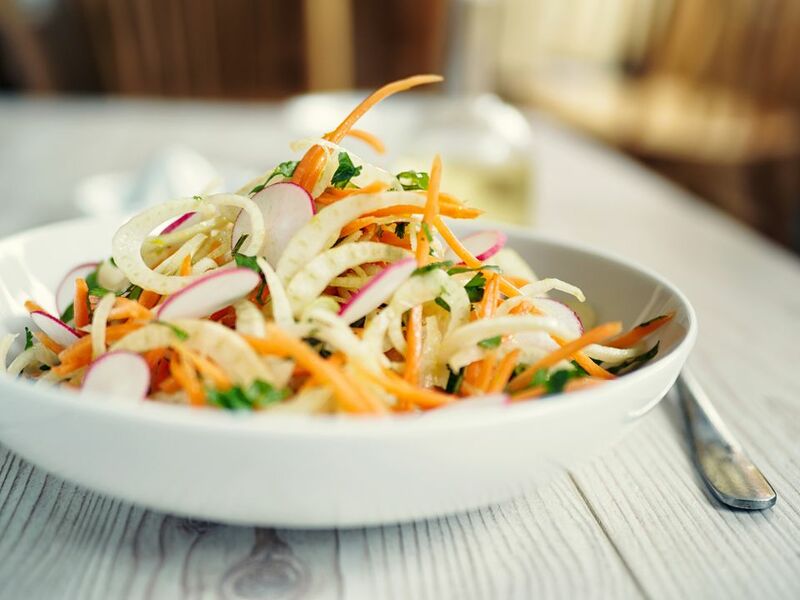 If you plan to serve the slaw outdoors for longer than two hours, consider resting the bowl of coleslaw over ice to keep it chilled and prevent any spoilage.